Our Results will Never Exceed Our Self-Concept. As you see in the chart, results come through behaviors that are underpinned by a particular mindset, which rises from our self-concept. 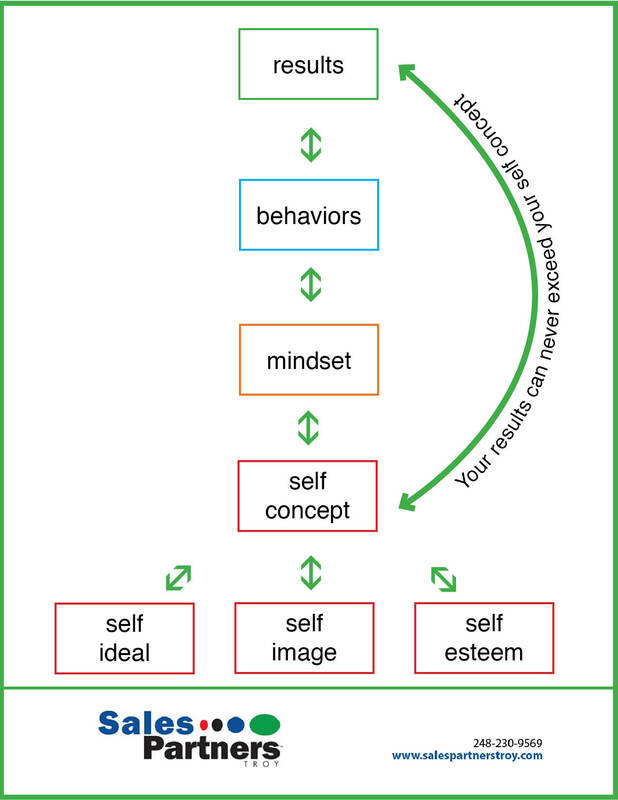 Our self-concept is comprised of our self-ideal, self-image, and self-esteem. So if we feel good about our ability as a sales professional, we’ll have a “go get ‘um” mindset, which will cause us to take the steps/behaviors that lead to sales, and see the results of those efforts. With each result we perceive as positive, our self-concept is bolstered, and we continue to move forward. But when we don’t feel so good about ourselves as sales professionals—sometimes even as human beings—we can walk around in a “poor me” or “I don’t know how to…” mindset. That kind of thinking holds us hostage, and we either do nothing, or in the worst cases, engage in self-sabotaging behaviors. And the results, of course, are not positive. But they mirror our self-concept—and that is the point. Your results will never exceed your self-concept. Blair Singer’s book, “Little Voice Mastery” gives 21 proven techniques for mastering the negative self-talk that plays a role in the self-concept. In our work, we’ve seen dramatic changes in people’s self-concept, mindset, behaviors, and results in as little as 12 weeks and recommend the book to all. This is an example of the topics we deal with each week in the SalesPartners Troy Sales Mastery classroom. You’re invited to experience one session as our guest, to make sure it’s a “fit” for you. Contact Us for details and upcoming dates. This entry was posted in Little Voice Mastery, Sales, Sales Mastery, Sales Tips, Sales Training, self-talk and tagged Blair Singer, Denise Roberts, Diane Putvin, Indecision, Little Voice Mastery, sales mastery, Sales Partners, Sales Partners Troy, sales tips, self-talk, Success & Failure. Bookmark the permalink. © Sales Partners Troy, 2011. Unauthorized use and/or duplication of this material without express and written permission from this blog’s author and/or owner is strictly prohibited. Excerpts and links may be used, provided that full and clear credit is given to Sales Partners Troy and www.SalesPartnersTroy.com with appropriate and specific direction to the original content.